Playtime is one of the most important parts of a child's development, giving them room to express their creativity, make meaningful discoveries and explore whole new facets of their imagination. Time and time again, LEGO blocks have ranked as one of the best toys to bring all of that mental fortune to fruition. Evolved from off-the-cuff, colorful childhood stacks to real-world, full-scale structures, we’ve rounded up 5 amazing life-sized projects that have taken this tiny little block from the kid’s playhouse to the zoo to as far up as the boardroom! 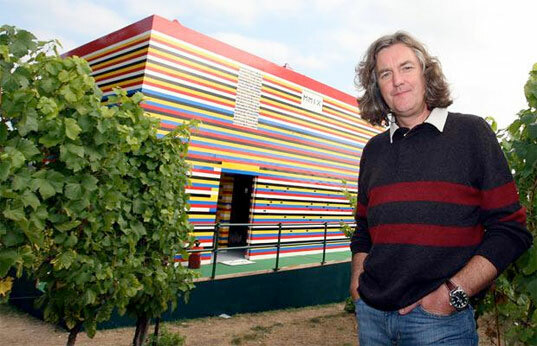 Short lived, but surely inspired, James May took a childhood dream and a BBC challenge and turned it into a multi-level home built from 3.3 million LEGO blocks. While the completed structure drew quite a bit of attention, once it was set on the market for sale, the colorful abode failed to attract any buyers and was eventually demolished. Thankfully, the massive pile of plastic blocks was donated to charity for continued kid-play. “I don’t wanna grow up!” And you don’t have to! Ecomat’s LEGO-like bricks are the perfect excuse for any adult to play with blocks. Made from 100% recycled materials, these colorful interlocking bricks are lightweight, earthquake resistant, and can be used to build practically any structure you can think of. The versatility and sturdiness of each block presents an excellent building material for developing nations or emergency housing applications. 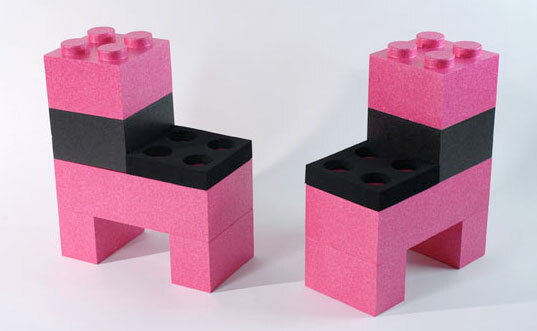 Bring out the inner child in even the most serious design snob with this fun modular, customizable lego furniture! 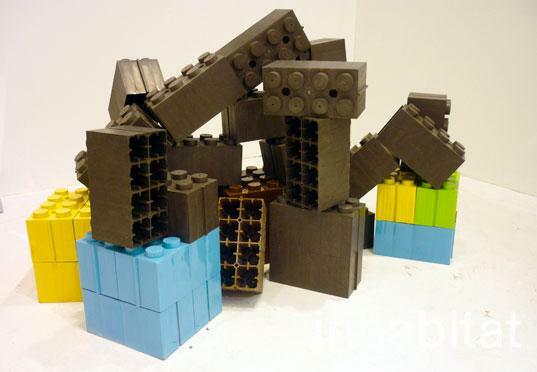 There’s no need to tediously stack thousands of Lego bricks together to construct these awesome lego masterpieces, because these giant Lego-like Lunasoft LunaBlocks can be turned into chairs, tables, and even sofas, using just a few blocks. Made of expanded polypropylene, they’re specially designed to be easily stackable, allowing DIYers to build (and reconfigure) an endless array of furniture options. 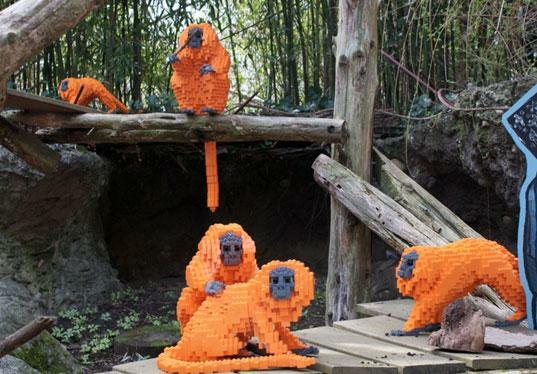 Taking 259,450 LEGO blocks, artist Sean Kinney has given a new face to endangered wildlife. In a captivating and curious exhibit called “Creatures of Habitat,” this timely exhibit features a number of kid faves such as polar bears, penguins, monkeys and turtles. The display currently on show at the Philadephia Zoo until October 2010 underscores the importance of protecting the Earth’s biodiversity, and even offers some kid-friendly tips on more eco-conscious living. Designed by Simon Pillard and Philippe Rosetti, the Munchausen Lego Kitchen takes a plain IKEA island and outfits it with more than 20,000 LEGO pieces. In a process that took more than a week to complete, the final results proved to be well worth the effort. This eye-catching mosaic is sure tickle the inner-child of even the most contemptuous adult. ABGC Architecture and Design may just have come up with the ultimate way to keep execs attentive and awake at those pesky board meetings. Built brick-by-brick for Dublin-based advertising agency Boys and Girls, this masterful centerpiece places 22,742 lego bricks in some enterprising adult hands to create a four foot by nine foot table top free of glue, but full of imagination. 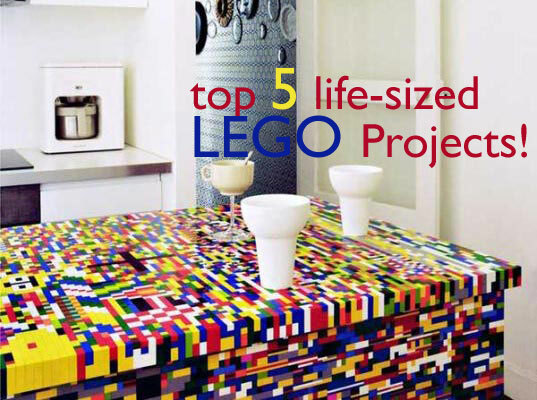 Top 5 Life-Sized LEGO Projects! James May’s LEGO Home Short lived, but surely inspired, James May took a childhood dream and a BBC challenge and turned it into a multi-level home built from 3.3 million LEGO blocks. James May’s LEGO Home While the completed structure drew quite a bit of attention, once it was set on the market for sale, the colorful abode failed to attract any buyers and was eventually demolished. Thankfully, the massive pile of plastic blocks was donated to charity for continued kid-play. Ecomat’s LEGO-Like Building Bricks “I don’t wanna grow up!” And you don’t have to! Ecomat’s LEGO-like bricks are the perfect excuse for any adult to play with blocks. Made from 100% recycled materials, these colorful interlocking bricks are lightweight, earthquake resistant, and can be used to build practically any structure you can think of. The versatility and sturdiness of each block presents an excellent building material for developing nations or emergency housing applications. Build Your Own Modular Furniture Out of Life-Sized Lego BricksBring out the inner child in even the most serious design snob with this fun modular, customizable lego furniture! Build Your Own Modular Furniture Out of Life-Sized Lego BricksThere’s no need to tediously stack thousands of Lego bricks together to construct these awesome lego masterpieces, because these giant Lego-like Lunasoft LunaBlocks can be turned into chairs, tables, and even sofas, using just a few blocks. Build Your Own Modular Furniture Out of Life-Sized Lego Bricks Made of expanded polypropylene, Lunasoft LunaBlocks are specially designed to be easily stackable, allowing DIYers to build (and reconfigure) an endless array of furniture options. Artist Populates Zoo With LEGO Sculptures of Endangered Animals Taking 259,450 LEGO blocks, artist Sean Kinney has given a new face to endangered wildlife. In a captivating and curious exhibit called “Creatures of Habitat,” this timely exhibit features a number of kid faves such as polar bears, penguins, monkeys and turtles. The display currently on show at the Philadephia Zoo until October 2010 underscores the importance of protecting the Earth’s biodiversity, and even offers some kid-friendly tips on more eco-conscious living. Incredible LEGO Kitchen Renovation Designed by Simon Pillard and Philippe Rosetti, the Munchausen Lego Kitchen takes a plain IKEA island and outfits it with more than 20,000 LEGO pieces. In a process that took more than a week to complete, the final results proved to be well worth the effort. This eye-catching mosaic is sure tickle the inner-child of even the most contemptuous adult. 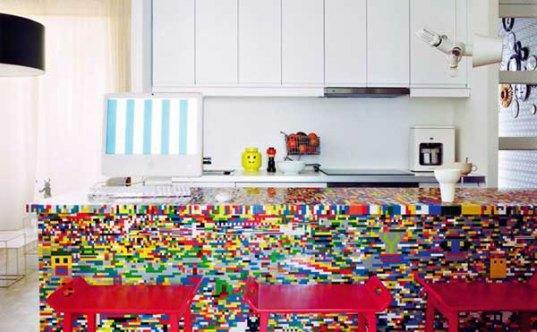 Incredible LEGO Kitchen RenovationThis eye-catching LEGO kitchen mosaic is sure tickle the inner-child of even the most contemptuous adult. 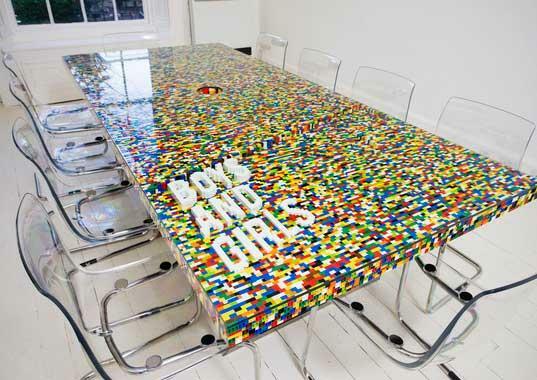 Amazing Boardroom LEGO Table ABGC Architecture and Design may just have come up with the ultimate way to keep execs attentive and awake at those pesky board meetings. Built brick-by-brick for Dublin-based advertising agency Boys and Girls, this masterful centerpiece places 22,742 lego bricks in some enterprising adult hands to create a four foot by nine foot table top free of glue, but full of imagination.